The films of Michelangelo Antonioni are aesthetically complex – critically stimulating though elusive in meaning. They are ambiguous works that pose difficult questions and resist simple conclusions. Classical narrative causalities are dissolved in favour of expressive abstraction. Displaced dramatic action leads to the creation of a stasis occupied by vague feelings, moods and ideas. Confronted with hesitancy, the spectator is compelled to respond imaginatively and independent of the film. The frustration of this experience reflects that felt in the lives of Antonioni’s characters: unable to solve their own personal mysteries they often disappear, leave, submit or die. The idea of abandonment is central to Antonioni’s formal structuring of people, objects, and ideas. He evades presences and emphasises related absences. His films are as enigmatic as life: they show that the systematic organisation of reality is a process of individual mediation disturbed by a profound inability to act with certainty. In Rome he began writing for Cinema, a hotbed of political and social criticism. Since the (neorealist) direction of the journal was contrary to Antonioni’s interests in alternative technical practices and filmmaking styles he stopped contributing after only a few months. (3) He spent a similar amount of time at the Centro Sperimentale di Cinematografia, making one, now lost, short film. A stint helping write Un Pilota ritorna (Roberto Rossellini, 1942) led to the signing of a contract with the production company Scalera. While drafted into the army, Antonioni still contrived to work under assignment on I Due Foscari (Enrico Fulchigoni, 1942) and Les Visiteurs du soir (Marcel Carné, 1942). Antonioni’s first documentary concerned the inhabitants of the Po valley region near Ferrara. Shot in 1943, Gente del Po was not released until after the war in 1947. In the interim, the bulk of the footage was lost through degradation, accident, and, possibly, deliberate tampering. Still, he displayed an early resilience and determination to complete the film, a trait that would resurface on numerous occasions in the future. 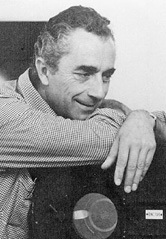 In the next few years, Antonioni continued to write criticism and screenplays, translated French literature, and made several more documentaries. N.U. – Nettezza urbana (1948) and L’Amorosa menzogna (1949), in particular, were well received: both won awards from the Italian Guild of Film Journalists and the latter competed at Cannes. On the strength of his documentaries, Antonioni secured financing from Vallani Film to make his first fictional feature in Milan. The narrational structure of a search with competing urges of desire and death surfaces in Cronaca di un amore (1950). 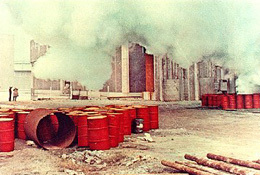 Antonioni will consistently return to this structure in his later works. The film’s protagonists are doomed past lovers who find their romance renewing and repeating itself with the same tragic ends. Their wish for the destruction of an intervening third-party twice comes true but on each occasion something unidentifiable is also lost between them. All that remains is an individual, separated existence. (An immediate, violent, desire-quenching version of the wish-device occurs, imaginarily, at the end of Zabriskie Point .) Cronaca is suggestive of film noir, (4) but Antonioni sidesteps traditional plot conventions to focus on the interior feelings of the lovers. He utilises a mobile camera, composes roomy frames, and follows the performers in deep-focus long takes. Key dialogue is highlighted by centrality, symbolism, frontality, unexpected movement, and cutting: a range of methods that define Antonioni’s precise emphasis of narrative by particulars of style. This approach occupies Antonioni’s formalism until more comprehensive analytical cutting techniques and less character-dependent camera movements arise first in Le Amiche (1955) and then more definitively in his first widescreen film, L’Avventura (1960). Perhaps Antonioni’s main concessions to the dominance of Italian neorealism are his configurations of class. As in Cronaca, the relatively poor female protagonist of La Signora senza camelie (1953) is thrust into a wealthy environment. From shop assistant to star B-grade actress, she is beset by the demands and advice of men. Her ultimate failure is an inability to control her own life. 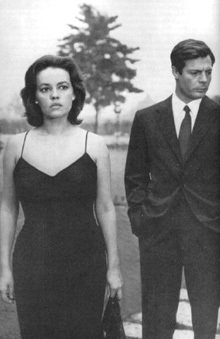 Antonioni has said that he considered the film to be a mistake because he concentrated on the ‘wrong’ character. (5) Who the preferable character might have been remains a mystery. The film’s style is similar to Cronaca, with an odd, perhaps absurd, reflexive effect: the melodramatic filmmakers within the story, similar to Antonioni, seem to be utilising mobile camera, long take strategies! I Vinti (1953), a trio of separate stories set in Paris, Rome, and London, was shot before Camelie but released at least seven months later. (6) Troubles that began in pre-production between Antonioni and the film’s producers presumably continued until the film’s premiere. (7) Additionally, the film was censored abroad which may have led to long delays. The reason for all the fuss was Antonioni’s insistence on portraying three murders and investigations without providing any moral, social or other evidence to identify the killers’ motivating reasons. Reconstructing the space evacuated by motive, Antonioni positions characters with respect to their environments, foregrounds landscape and experiments with independent camera movement. This destabilising of character and narrative by formal abstraction continues to be emphasised as Antonioni’s style develops. His next work is a complex example. Tentato suicidio is staged amid artifice but presents a range of stories about attempted suicide that purport to truth. Cesare Zavattini, producer of L’Amore in città, intended its segments to record the daily life of “ordinary” people. Antonioni takes Zavattini’s quotidian premise and, rather than concede to it, investigates its validity. Four of the stories are reconstructed and their non-fictional guises come under threat from the fictional probing of the cinematic stylistic system. Even in the presence of non-actors who tell their own stories, Antonioni is incredulous of a basic “real” dimension. The complexities of Antonioni’s multi-actor staging style are not as apparent in Il Grido (1957), a bleak portrayal of one factory worker’s journey away from home, through various liaisons, and back again. There is a return to the use of a mobile camera paired with analytical cutting (including some reverse shots) to serve the interests of dialogue. The constant state of Aldo’s (Steve Cochran) agitation is emphasised by this more rapid technique of editing. Even the longer shots (at least three are just over a minute long) concern arguments between Aldo and women. What sets Il Grido apart from Antonioni’s previous films is his stylistic response to a different milieu. Dank, gaslit interiors are tight spaces forced by the staging into a moderate depth. The result is an effect of oppression from which Aldo always tries to escape. But when he surges outside, the land is such a contrast that it too is threatening. Antonioni generally maintains a high horizon line, emphasising the flatness and desolation of the background. The high camera angle also accentuates the smallness of Aldo’s daughter, Rosina (Mirna Girardi), whom Aldo is unwilling, or unable, to properly father. When he sends Rosina home on a bus, the element of pathos generates a strange and rare Antonioni moment. It is an interesting opposition to the awkward attention seeking of Valerio (Valerio Bartoleschi) in Il Deserto rosso (1964). Antonioni’s next four films frame the period of his most intense and, it is generally accepted, productive work. Some consider L’Avventura, La Notte (1961), and L’Eclisse (1962) a trilogy (or, with Il Deserto rosso, a tetralogy) of sorts, largely because of a consistency of style, social setting, theme, plot and character (especially the roles played by the ubiquitous Monica Vitti). (11) The usefulness of such a categorisation is questionable. (12) However, at least in the first three, Antonioni demonstrates a formal stability between films that, considering his earlier fluctuations in method, is surprising. Part of what makes L’Avventura so impressive is that Antonioni developed a cohesion of narrative and stylistic devices that had only haphazardly surfaced in his earlier films. It might not be too ridiculous to suggest that analogous to some of his characters, Antonioni was searching for something, a method of communication, which he finally “found” with L’Avventura. That he wouldn’t let go until he had explored the approach a couple of films further, is retrospectively understandable. It is with these films that Antonioni became a famous, critically esteemed, and even popular filmmaker. Concurrent with a boom period in the Italian industry and a re-vitalisation of European cinema in general, Antonioni was suddenly reflective of a massive change in film culture that he had really been progressing towards for the last decade. The critical discussion of these films is so extensive that I will forego summarising them here. But it is worth mentioning that a fundamental element of “the trilogy” is Antonioni’s increasing interest in the abstraction of space: for instance, the shot of the church in the deserted village in L’Avventura; the opening shot of La Notte that tracks down the Pirelli building; and the final seven minute montage of L’Eclisse. These kinds of independent, wandering, investigative techniques are dominant traits in Il Deserto rosso, Blow-Up (1966), Zabriskie Point and The Passenger (1975). However, there is expansive conjecture regarding their purposes and effects. Il Deserto rosso marked a turning point. Antonioni’s shifting directions of interest compelled him to explore international markets, include male protagonists, and vigorously question the nature of photographic reality. In this transitive period, he made another short film, Il Provino (1965), a preface segment for Dino De Laurentiis’ I Tre volti, starring Saroya, a past queen of Iran. Compared to the troubled Zabriskie Point, the story surrounding the risky production and exhibition of Blow-Up is a relatively happy one. When Antonioni went to make a film in America, he decided to make a film about America. He said, “I see ten thousand people making love across the desert.” (15) And the problems began. The Passenger is another open text, full of self-reflexive concerns such as perception, reality, identity and truth. Past narrative techniques are further explored: doubling, journeying, constructing an unseen death. While Blow-Up investigates the possible, but redundant, existence of an object, this is a search that turns inward and ultimately finds nothing. 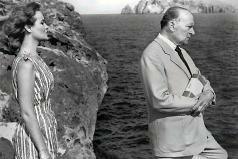 Antonioni’s style in these three films is far removed from that of the ’50s’ films. The earlier invocation of interior moods and feelings has been discarded in favour of a construction of exterior things in their own various contexts. His characters are now positioned as part of a complex network of objects and inter-subjective relationships. The camera no longer functions to serve the action; it becomes a tool for Antonioni to inscribe meaning. He asks questions that are best resolved by stepping outside the fiction and considering the film’s structure of organisation and cognition. By incorporating the film viewing experience into the story, his formal choices are layered with a political subjectivity: he explains how ideology is working within the film. The height of such artistry explains the relative disappointment, to most, of the rest of Antonioni’s films. Il Mistero di Oberwald (1980) is an abrupt swing away from epistemological preoccupation. 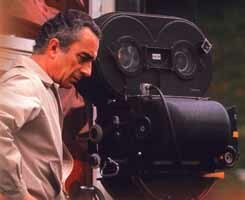 Made on video for television, it provided Antonioni relief from high budget production burdens. Excited by the potential of new filmmaking technologies, he experiments with post-production colour manipulation to produce unusual effects. In other respects the film is less daring, perhaps a signal of Antonioni’s desire to move in a different direction but not quite knowing where. With Identificazione di una donna (1982), he returns to older concerns. A specific filmmaking problem (the processing of choices available to a director) is merged with devices of searching, uncertainty and sudden abandonment. It is tantalising to put Antonioni in the shoes of the director in the text, opening up a reading that suggests a confusion about what kinds of films he ought to make. But it seems just as sensible to consider Identificazione as a re-focusing on the hesitant, anxious individual, now framed by apparent self-reflexivity. Its formal system is a balance of autonomy and traditional continuity: a complex arrangement, both distancing and engaging. The problem may reside in the mix. At this late stage in his career, Antonioni and the film’s producers may have felt it necessary to appeal to a large, international market. He expected to continue making pictures, but the lack of success here probably assisted in the halting of his progress. In the historical context of a worldwide resurgence in mainstream cinema, the inability to construct a narrational or stylistic pigeon-hole for Identificazione was troublesome. Thirteen years later, after a debilitating stroke left him unable to speak, Antonioni was able to make Al di là delle nuvole (1995), with Wim Wenders providing insurance should the production come into difficulty. For most critics, the return was welcomed even though few admired the film. This time, it may be impossible to reject the alter-ego hypothesis: a lot of the wandering Director’s (John Malkovich) dialogue is culled from Antonioni’s interviews and writings. However, the Director’s presence within the film is largely observational. Even his affair, in the second of four segments, occurs because of a voyeuristic curiosity. His presence bares witness to a nexus of love stories, a collection of events he has been told, or possibly invented. They are lost stories, in the sense of being momentary, transitory, and disconnected in space and time. In an authorial context they are stories Antonioni has told elsewhere, not directly on film. They existed outside of cinema, beyond the clouds of the imaginary. Without the benefit of the cinematic apparatus, without the human capacity, continually stressed in the cinema of Antonioni, to observe and perceive, most of us would never hear or read them. No one would have seen them. I am unable to verify the productions of Roma – Montevideo, Oltre l’Oblio, Bomarzo, and Ragazze in Bianco. Presumably short documentaries made between 1948-1950, they are not listed in most filmographies. More extensive filmography details are included in the books by Ian Cameron and Robin Wood, Seymour Chatman, and Peter Brunette (see below). Comprehensive bibliographies are available in both Chatman and Rohdie. In Italian, highly regarded and often cited works include: Lorenzo Cuccu, Le Visione Come Problema: Forme e Svolgimento del Cinema di Antonioni, Rome: Bulzoni, 1973; and Giorgio Tinazzi, Michelangelo Antonioni, Florence: La Nuova Italia, 1974. Includes a short biography, filmography, forum and an essay by Sam Rohdie. A small but well designed site with synopses of his films and a forum for discussion. Glen Norton’s site has a few links, a filmography and an essay “Antonioni’s Modernist Language” which suggests Antonioni’s is the first truly modernist cinema in its portrayal of incompleteness and alienation. This entry in Aquarello’s much-loved site comprises reviews of Il Grido and Blow Up. Focusing on Il Grido, L’Avventura, La Notte and Beyond the Clouds and often employing a comparative approach, this page looks at themes, visual style and performance in Antonioni’s cinema. A piece by Antonioni (originally published in Cahiers du Cinema, October 1960), published here in EuroScreenwriters online journal. Review of The Passenger as part of Derek Malcolm’s Century of Films feature. Different sources give different dates, ranging from 1938 to the early 1940s. For a full account of this experience, see Antonioni, The Architecture of Vision, pp. 14-15. An excellent account of Antonioni’s uneasy relationship with the Cinema journal is found in Rohdie, Antonioni, pp. 8-14. The Italian film noir, or giallo, is contextualised with respect to genre and Hollywood in Chatman, Antonioni, pp. 12-21. This could be incorrect. If the Ian Cameron and Robin Wood filmography (which is used verbatim by Seymour Chatman) constitutes an “official” document, I Vinti was first screened at the Venice Film Festival, September 4th, 1953 (after being shot in 1952). La Signora senza camelie (shot in winter 1952-53) premiered in Rome, February, 1953. It would be easy to consider the Venice date a typographical error. But even if this is so, if I Vinti premiered in 1952 as most filmographies claim (without supporting evidence), this at least indicates the insecurity of such published information (and highlights the problem of faithful Chatman-like copying). The other explanation for the discrepancy is a reluctance to temporally distance a film from the time it was made, regardless of its actual release date. The film’s production difficulties are touched upon in Chatman, pp. 21-26. Antonioni was more concerned about the lack of criticism regarding his stylistic choices related to unmotivated drama: see Antonioni, pp. 263-268. 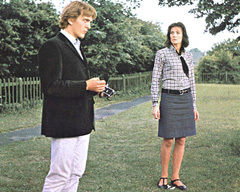 To me, the third story between Momina and Cesare, suggested in Cameron and Wood, Antonioni, p. 54, is more of a disconnected sub-plot. Its comparative romantic/sexual ease doesn’t seem to interest Antonioni as much as foolish tragedy (Rosetta) and its determined avoidance (Clelia). Strangely after identifying ‘the Rosetta-Lorenzo-Nene [Valentina Cortese] triangle’ as ‘the central story’ (53), Cameron later asserts that ‘it is impossible to pick out a storyline in Le Amiche‘ (65). Cameron and Wood, pp. 50-53; Chatman, pp. 36-38; Rifkin, Antonioni’s Visual Language, pp. 26-27, 71-72. The beach scene contains a shot similar to a previous set-up in the art gallery: Rosetta’s (inactive) painting hung between Nene (on the right, reflective) and Lorenzo (dominant in the left foreground) while now she herself is an active presence (left, dominant), Nene is again contemplative (right), and Lorenzo, in the background, is centered and moving but engaging little interest. The second instance reinforces the first and suggests what is still unclear in the narrative: that Lorenzo and Rosetta are about to have an affair and that Nene will be its victim. Only when Rosetta commits suicide (deactivates) are Nene and Lorenzo staged together with no intervening other. Cameron and Wood consider the first three a ‘loosely connected trilogy’ (93), as does Rohdie, p. 114. Four chapters in Chatman are devoted to an analysis of ‘The Great Tetralogy’. See Brunette, The Films of Michelangelo Antonioni, pp. 5-6. Andre Bazin, “The Evolution of the Language of Cinema,” in What Is Cinema? Volume One, ed. and trans. Hugh Gray (Berkeley and Los Angeles: University of California Press, 1967), p. 35. Beverly Walker, “Michelangelo and the Leviathan: The Making of Zabriskie Point,” in Film Comment, 28, 5 (September 1992): 42. Written by the film’s publicist, this account conveys a range of disturbances and oddities that affected its production. A colour-related symbology of such a reading is comprehensively detailed in Rifkin, pp. 109-115. Rohdie is sympathetic to the film, calling it ‘one of Antonioni’s very best,’ (73) but he does not, substantially, say why. Another account stresses a Freudian reading and the theme of individualism; Arrowsmith, Antonioni, pp. 127-145. …than claims of Zabriskie Point‘s anti-Americanism. Surely the portrayed sector of disaffected youth cared little for such sentiments. Or did they? Or were they a much smaller target audience than intended? Or not targeted at all? Or did critical backlash ruin the film’s chances? Or? Nobody has successfully answered why Zabriskie Point was such an utter commercial failure. It was made for about $7,000,000 and grossed $891,918; Chatman, p. 160. James Brown is a post-graduate Screen Studies student at Flinders University in South Australia currently finishing a thesis on the popularisation and regionalisation of recent South Korean cinema. He writes reviews for Heroic Cinema and was print co-ordinator for the 2003 and 2005 Adelaide Film Festivals.